With little time to rest and recover we're off on the road again this afternoon as we had to Fulham. The one positive we go into this game with is the victory with QPR will have us in the mood for more. On the other hand, our opponents today will be ruing their misfortune after conceding a 90th minute equalizer against Norwich on Saturday. But this is a London derby and we know how difficult games like these are. We saw how determined Martin Jol's team were when they came to the Grove in November with the intention of taking a point home with them and were only fortunate to do so after a lucky break which saw Thomas Vermaelen put into his own net. Vermaelen of course won't play this afternoon after picking up a calf strain in the QPR win. Unless of course he has a Johan Djourou style recovery, which I don't see happening. That leaves the manager with a tricky decision to make as to who to play at left back. We know that Kieran Gibbs and Andre Santos have no chance of returning. So what does the manager do? Wenger had no defensive options on the bench for Saturday's game, so we couldn't have seen what choice he would have made had Ignasi Miquel been there for him to pick. Francis Coquelin came on and did a good enough job. That's twice within recent weeks he's performed well at full back, on the right against Villa and for 40 minutes on Saturday. Already there is increased noise that we'll sign Wayne Bridge but I don't see Wenger making that move. He's been out of first team football for too long to come in and make an immediate impact that we need from a loan signing. The Daily Mail have linked us with a move for AC Milan left-back Taye Taiwo. I don't know anything about the player, but with our European game with them coming up next month, I'm not sure they'd be that keen to do business with us now. One thing is for certain. Arsene Wenger does need to do some business this January, especially by bringing in a full back on loan. He shouldn't be allowed to procrastinate on whether to do the business we can all clearly see needs to be done. We have important games coming up in the next two months. I would hate us to lose our momentum in securing a top four finish by the manager's decision not to buy this month. We saw what happened this time last year when Thomas Vermaelen was due to return and then had a set back which meant we didn't see him again until the final three games of the season. For this afternoon, I think we should bring in Miquel. I think he's done ok when played out of position at left back so far this season and I think he'll be able to do a job for us there later. The manager may want to rotate a bit in the forward positions. A decision will be made this morning about whether Robin van Persie will start, but I think the Dutchman should start from the bench. He's had two tough games inside a week and for the sake of not being rested and getting injured, I think we should take a long term view with his fitness. It's better to have him playing than out and I know.he'll have two weeks to recover after today as he won't be involved in next Monday's FA Cup tie with Leeds, but even so I think the manager should urge on the side of caution. And our captain and leading calendar year goal scorer says he's in the form of his life. "It’s fantastic. And it was about time! I have had some knocks in the past, but 2011 was clear with no injuries and I could enjoy myself. It has been my best year ever. "There’s a bit of relief that the year has gone how it did, but I’m also happy to give something back to Arsenal and the boss." Let's hope he can start 2012 where he left off last year. We know we've got options once Thierry has signed, which isn't expected to be in time for this afternoon's game. But with Chamakh and Gervinho off to the Africa Cup of Nations, Thierry will need to start a few games and with Park all but disappearing from the first team squad. 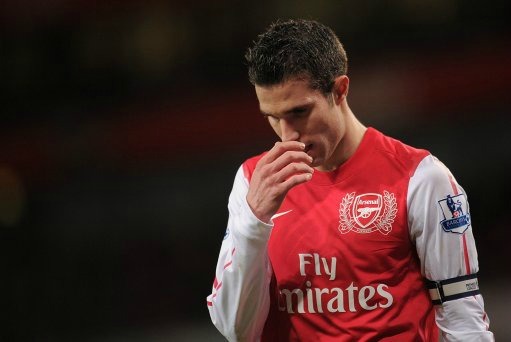 And Robin has said how grateful he is that the Frenchman has agreed to sign, after a lot of ear chewing in training. It appears Robin's been tapping him up! "It is fantastic. I asked him a couple of weeks ago. I had a little cheeky question and asked whether he was willing to come back. Everyone has been working on him over the last couple of weeks. "It will be good for everyone. It is a massive joy to play and train with him. I am excited too. It's like 'oh yes, Thierry is back, let's have fun!'" I know from speaking to the guys I watched the game on Saturday with that they are excited to see Henry return. We all know he won't be the same player we saw in his Highbury pomp, but it will be exciting none the less. And it's great that the players are looking forward to it as well. Van Persie has also called Henry's decision to rejoin the club "brave". As for today's team, I'm expecting the only three decisions the manager has to make are over who will play left back, will Gervinho return for Arshavin and if Robin starts. I'm off to the Cottage this afternoon, so I'm certainly hoping for us to bring all three points back to north London. In other news, the Daily Mirror report we're fighting it out with Chelsea for the signature of Crewe’s 17-year-old striker Nick Powell. It wouldn't be beyond reasoning that when we need a defender the manager goes out and signs a forward. And finally it was good to read in the match day programme that the players and their parters were spending New Year with one another. It seems as though Mikel Arteta and his wife have finally found themselves a house - thus moving out of their hotel rooms - and celebrated the New Year with Robin van Persie and his wife Bouchra amongst others. I really like the fact the team are bonding off the field as well as they appear to be on it.